Fire extinguishers are necessities in any building. Fire extinguishers are necessities in any building. 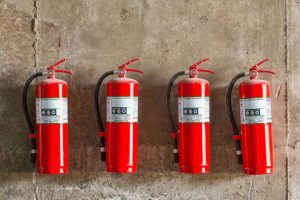 Whether they’re used in homes or businesses, a fire extinguisher can make the difference between a funny anecdote or source of a joke and a tragic disaster. Make sure that your fire extinguishers are well-cared for; that way they will work when you expect them to! Expired fire extinguishers are a potential hazard, though, so you need to know what to do with them. You’ll want to figure out which fire extinguishers still work and which ones don’t. In some cases, an empty fire extinguisher will need recharging. If that’s all it needed, then you won’t need to replace or get rid of it. Even so, there are bound to be some extinguishers you must part with; that’s because they’ll be too damaged to rely on anymore. One way to determine if the fire extinguishers are still intact is to test the canister. You’ll also need to look for any signs of cracking or leaking in the shell of the extinguisher. If the nozzle and hose are blocked, then you will also need to do something about that. Make sure there is an inspection tag, because if you don’t see one, then that’s a bad sign. You won’t be able to tell when the last inspection happened or whenever the fire extinguishers underwent maintenance. These are both urgent problems that need to be corrected as soon as possible. Check to make sure that all pins and handles are still in place. If they’re missing or broken, then you will also need to replace the fire extinguisher in question. Now that you’ve removed the old fire extinguishers and put new ones in their place, you will have to dispose of the expired fire extinguishers. There’s a right way and wrong way to do this. Don’t treat your old fire extinguishers the same way you would paper or cardboard trash, though. The extinguishers still contain chemicals that can harm your surroundings. What you need to do is reach out to local fire departments or hazardous waste disposal facilities. They’ll know what to do next. This entry was posted on Friday, February 1st, 2019 at 10:37 am. Both comments and pings are currently closed.